We check out the very top of the range Crosstrainer in York’s line up of 5 ‘Perform’ machines. With the other models being rear-wheel driven, we were eager to see what you can expect from the extra investment of this front wheel driven Elliptical. First things first, the machine obviously needs assembling, but this shouldn’t be too daunting a prospect for anyone with the patience to follow the instructions! York has been rather helpful in segmenting the bolts and bits into areas within the blister packet that are clearly labeled and coded to their corresponding ‘steps’ of the assembly process. There are 8 steps to work through in all, so it’s really just a matter of patience and concentration! There is not much that can be more frustrating and time-wasting than bolts that don’t line up due to poor engineering, thankfully York seem to have manufactured the 230 Model with the same high quality components and precision that we have come to expect from them in past tests. The bolts, screws and holes aligned correctly and tightened securely. When you climb aboard and begin to pedal, there are two things that instantly impress. Firstly, we are pleased to state that the Perform 230 is self-generating so there’s no plug, no messy cables and no need to site the machine by a mains socket. Secondly, it’s built to cope with users weighing close to 23 and a half stone (150kg) which is indicative of how sturdy and well constructed the ‘230’ is. So what’s it like in use? We’ve obviously tested countless ellipticals over time, to share our reviews with you, so we’re no strangers to the usual feel of a front-driven machine…. However, the Perform 230, has a ‘motion’ that came as quite a surprise! The elliptical arc is exceptionally shallow (about 6″ of vertical travel over the 19″ stride length). This means that unlike the typical oval motion you’d expect, the Perform 230 action is rather like ice-skating! The shallow stride may not appeal to traditionalists, but we really liked the sensation, and it’s certainly a cut above many ‘bouncy’ rear-drive ellipticals you’d experience at this price point. The combination of chunky rollers gliding up and down 40 mm thick tubular steel guide rails and a 7kg flywheel and quality drive components, make for a smooth action. The dynamic handles have a rubberized grip bulking them up to 40 mm in diameter and although the crank arms aren’t over-kill in their construction, they still feel substantial and there’s not too much flexing as you pull and push to work the upper body. The console itself is rather typical of the Perform range, although unlike the mains powered models, this doesn’t have a very vibrant, colourful display. That said, the light blue LCD digits against the black 125 mm x 55 mm stands out with crystal clarity. The screen is clearly divided up with all of the important training feedback being allocated it’s own area in a row along the bottom of the screen. The top section is made up of a program menu, which is easy to navigate through by using the shuttle dial in the centre of the console. The console itself is intuitive to use and it doesn’t take a minute before you familiarize yourself with the layout and settings. Aside from the Shuttle dial, there’s only 4 other buttons on the console, 2 of which are rather unique to York machines. The ‘Body Fat’ program allows a user to monitor their body fat percentage and B.M.I by entering their personal details (gender, weight etc) and holding onto the pulse-grip sensors on the static handles until the figures are displayed on screen. Alternatively, the sensors can be used to monitor how efficiently your pulse rate returns to normal during a 6o second period after exercise. The computer then gives you a score from 1 (Outstanding!) to 6 (Poor!). There’s the provision to create and store up to 4 user-defined programs. Plus 4 users can also enter and save their personal data such as gender, height, age etc to give more accurate feedback to calories, body fat and heart rate programs. Speaking of heart rate, we were disappointed to see that there is no inbuilt receiver for wireless monitoring so it must be noted that by using the pulse sensors, the readings may be inaccurate. That said, it’s a bonus that there are 4 heart rate controlled programs that can be utilized by grasping the sensors, and the machine will adjust the resistance to keep within a pre-set target. The Perform also works as an ergometer in that it can be set to automatically adjust the resistance according to your energy output in the ‘Watts’ program. When it comes to adjusting resistance, York have really pushed the boundaries in terms of tension! 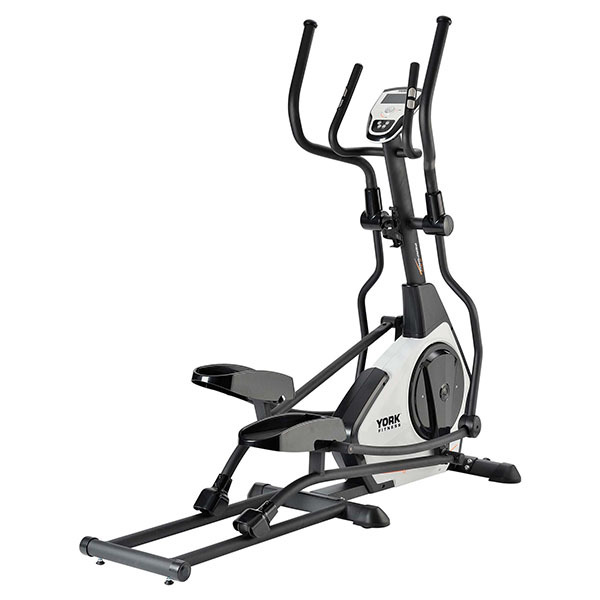 If you’re looking for a Crosstrainer that can tone the muscles as well as improve fitness, the Perform 230 should deliver as much resistance as you can handle!! There’s 32 levels in total and the magnetic resistance really bites in on those higher levels! Combine all of that with the usual manual program and 12 pre-set courses and you can see that the Perform 230 has scope for long term appeal and challenges. To sum it up, aside from the noticeable absence of an inbuilt heart rate receiver, it put a bold tick in the box of nearly every feature we would expect from a machine built for performance. The clue is in the title of the range – this is a machine designed to ‘Perform’ and as such the focus has been aimed at useful functions that monitor progress or promote conditioning. There’s no MP3 dock, speaker system or cooling fans…. 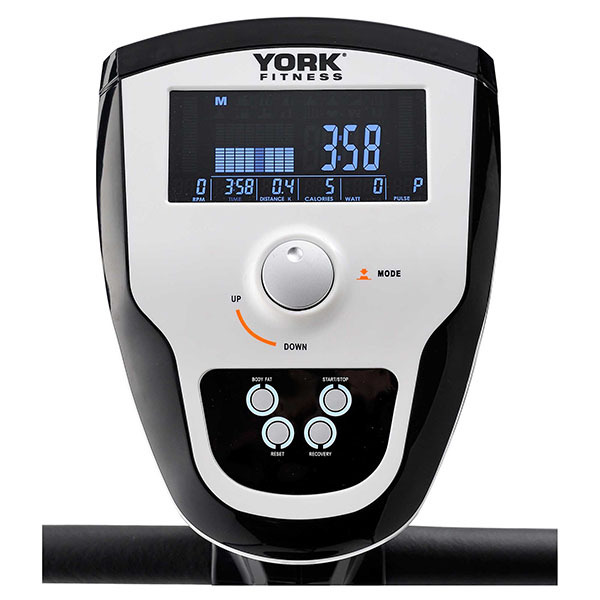 but if you want a functional, well-built ‘tool’ for toning muscle, burning fat and improving fitness then the York Perform 230 is worth looking at. With the Perform 230, York have delivered a good front drive elliptical cross trainer here, but in the process of keeping the price down, they've cut a few corners to save cost (such as not putting in a wireless heart rate receiver), which does let it down, so if you're in the market for a front drive elliptical we'd suggest you should go for the Proform 7.0. It is available for a little more but with a much heavier flywheel, adjustable stride and incline, iFit compatibility and a Bluetooth wireless heart rate receiver, it is well worth the money! Shallow elliptical motion may not appeal to all, but we liked the feel!